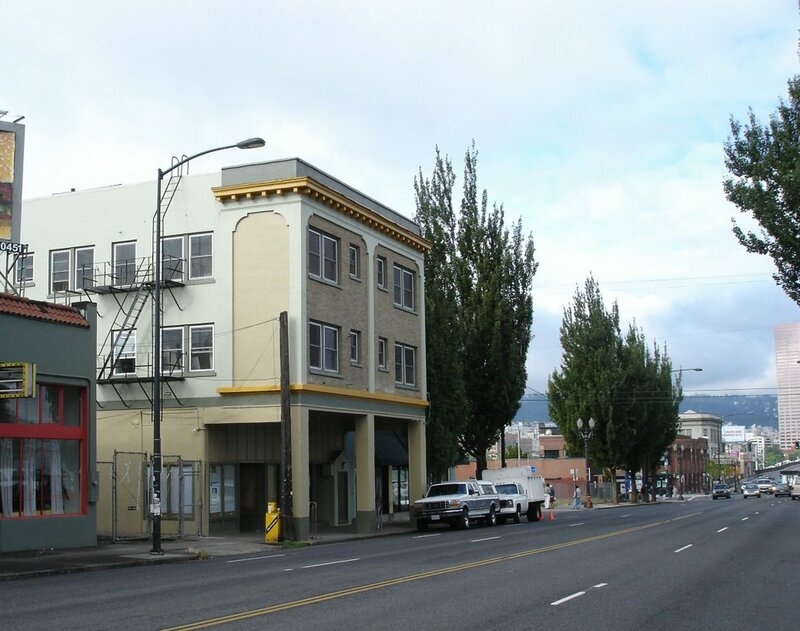 They were called the Arcades: Those buildings on East Burnside with their upper floors above the sidewalk. They date to a 1928-1929 street widening project which added two extra lanes to East Burnside, at the expense of the sidewalks. When the sidewalks were re-installed, it was at the expense of bordering storefronts. Of the original ten between Union (MLK Blvd.) and SE 11th, five remain. A city ordinance in 1926 authorized the project. It soon ran into a controversy over how many buildings were to be “arcaded” and what compensation was to be given the owners. The issues were solved over the next two years and easements granted to the city “for the lifetime of the building(s)” in 1928. In 1968 they were once again confronted by Burnside’s voracious appetite, as the Portland Chamber of Commerce proposed to widen the street into a six lane thoroughfare. Nothing came of the idea. Over the years they have housed a broad cross section of Portland life. Hotels, apartments, markets, taverns, strip joints, restaurants, coffee shops, saw sharpeners, phone rentals, music venues, auto shops, union halls, barber shops, plumbers, floor coverers, dance halls, shoe repairs, restaurant supplies, pagan supplies, clothing manufacturers, a candy factory, a bookstore, a hardware store, an oil burner distributor, Masonic halls and many others have called the buildings home. A better illustration of Jane Jacob’s maxim that a city needs old buildings to incubate businesses can hardly be found. 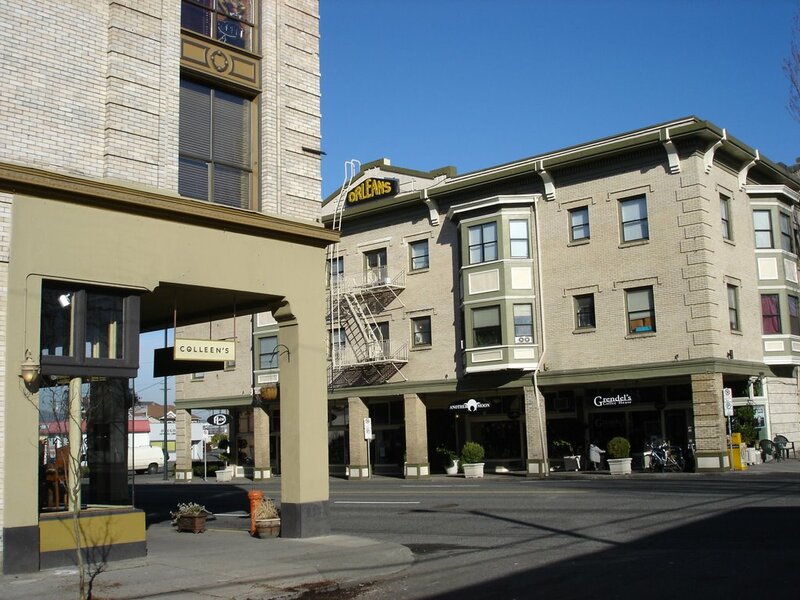 (Columbia Sportswear was housed in one of the buildings in the early 1960s). 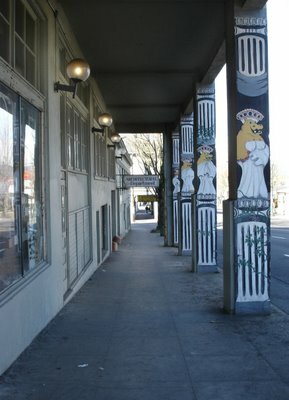 The Arcades are an architectural vernacular unique to a single street. Albeit accidentally, they are incredibly well suited to Portland’s wet climate. 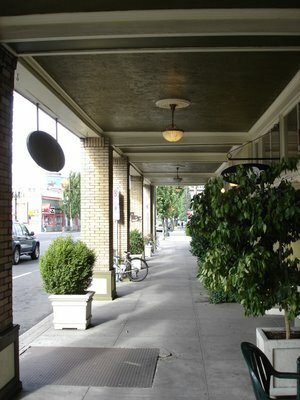 Amend Portland’s Building code to allow, even encourage, the construction of new “Arcades” on Burnside between MLK Blvd. and SE 11th. Future Restaurants and bars could open out onto the covered sidewalks, blurring the boundary between indoors and outdoors. Space heaters would make outdoor dining possible for much of the year. The upper levels of the new buildings could be setback to allow patio space with full exposure to the sun and stars from above the walkways. As new buildings gradually infilled between originals, commercial momentum generated by the new Burnside Bridgehead Development would continue east, with a unique streetscape from very local roots. If the Burnside / Couch couplet plan is adopted, the decrease in traffic would make the area even more attractive to street level activities. 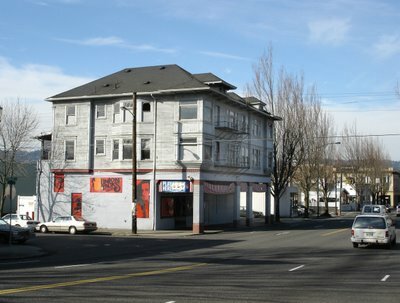 Building on Burnside’s past, an “Arcade district” would expand upon the character of the old East Portland street, creating an area well adapted for year-round use. The largest and most impressive was the first to go. 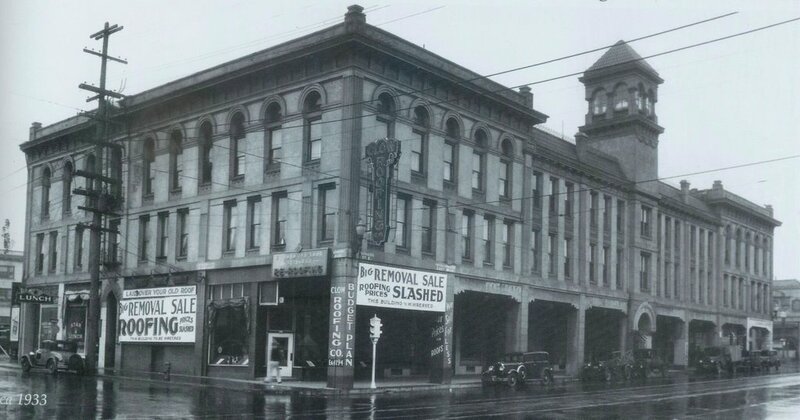 The Burkhard Building was on the north side of Burnside between Union and Grand. 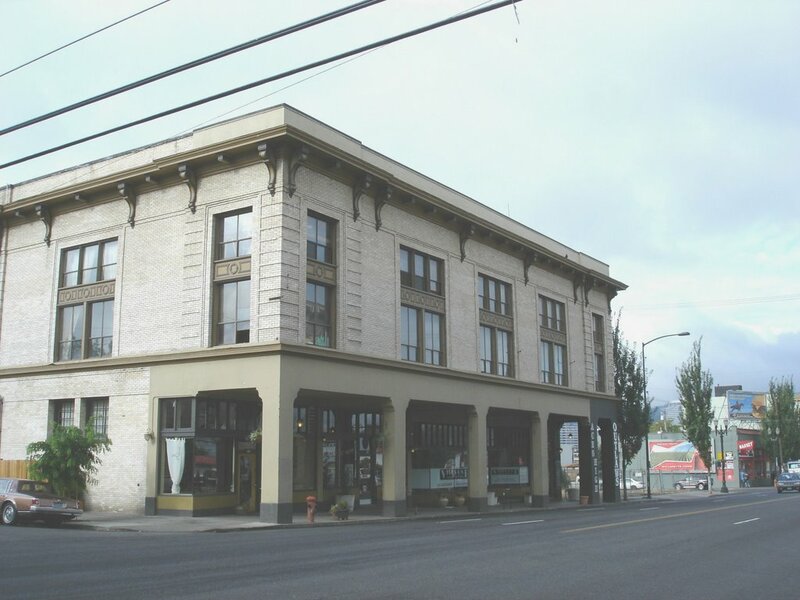 It was built 1894, four years after the City of East Portland was merged along with Albina into Portland. The building housed a large dance hall and other businesses. In 1908 the upper floors were made into a Hotel, which was renamed the Arcade Hotel after the street widening. It was torn down in 1934. Today it is the site of Convention Auto Wholesale. 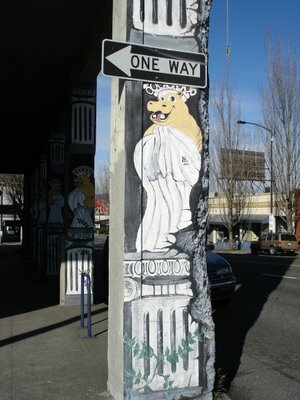 Photo is from the book “Progressive Portland-On the Move” courtesy of the author, Donald R. Nelson. 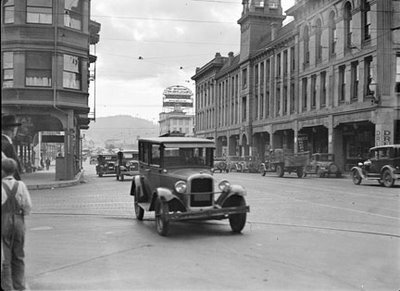 The Burkhard Building taken from the south side of Burnside, July 2nd 1931. 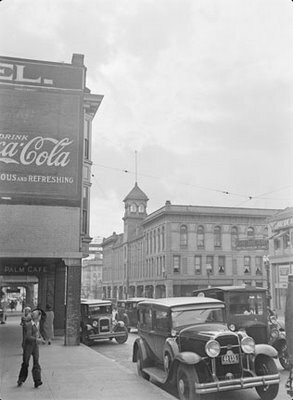 The building to the left (now demolished) housed the New Arcade Apartments in the late 1920s-1930s. The Kern Building (demolished), March 13th 1930, at the southwest corner of Burnside & Grand (the New Arcade Apartments on the southwest corner are visible on the next block). The building housed the Lloyd Hotel, Coleman Drug and the Palm Café. Note the original curb line still visible after the widening project. #612-616 E. Burnside was built in 1913. On the next block (at the trees) is the site of the Kern Building (previous picture). The building is currently vacant. 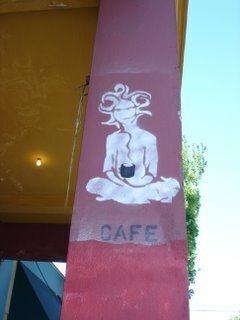 Recently it was an IWW Union Hall and the Back to Back Cafe. The upper floors were known as the Mattsonian Apartments from 1921 to 1990 (when the name falls out of use in city directories). #614 was a barbur shop for many years: Davie Norman's (1925-1942) then Chris & Davie's (1942-1950), C.E. Kingsley's (1950-1952), Al's (1952-1967), and Bill's (1967-1968), which was upgraded to Bill's Roffler Razor Styles (1968-1969). Brownies Barbur Shop (1970-1971) was the last. The space was used for storage from 1973 to 2003. Walt's Cash Grocery was next door, at #616, from 1936 to 1949, followed by Fultz Market Groceries (1950-1952). 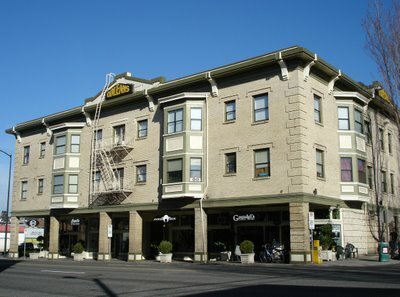 Alex Groceteria (a word that seems to have vanished from the language) moved there in 1953 from #738 Burnside, (another arcaded building a block east). It was Ray's Groceteria from 1958 to 1971. Between 1972 and 1978 it was the home of The Grape Estate, Wine and Beer Sales. From 1978 to 1988 It was the Boondox Tavern. #722-737 E. Burnside is home to Hatties (vintage clothing), Another Moon (a pagan / new age store), Grendell's Coffee Shop and the Orleans Apartments. It was built in 1909 by James H. Page. From 1909 to 1920 the apartments were called the Page Apartments. They were renamed the Alice Court Apartments in 1920,( that name appeared in city directories until 1988). #727 (Grendell's Coffee Shop) was the location of a candy maker in the late 1920's. It was the Alice Court Restaurant 1935 to 1946 when the name changed to Alice Court Tavern. Things then took a nautical turn, the Port Hole Tavern (1959-1960) and the Pilot House Tavern (1961-1977). 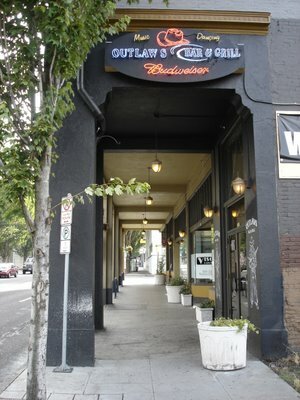 It was East Avenue Tavern and later Beglan's East Avenue from 1978 to 1997. Grocery stores in the building included Dea's In and Out (1996), the Dai Chung Market (oriental food and gifts, 1982-1992), C.M, Henderson Grocery (1925-1926) and G.T. Eliopoulos Grocery (1923). 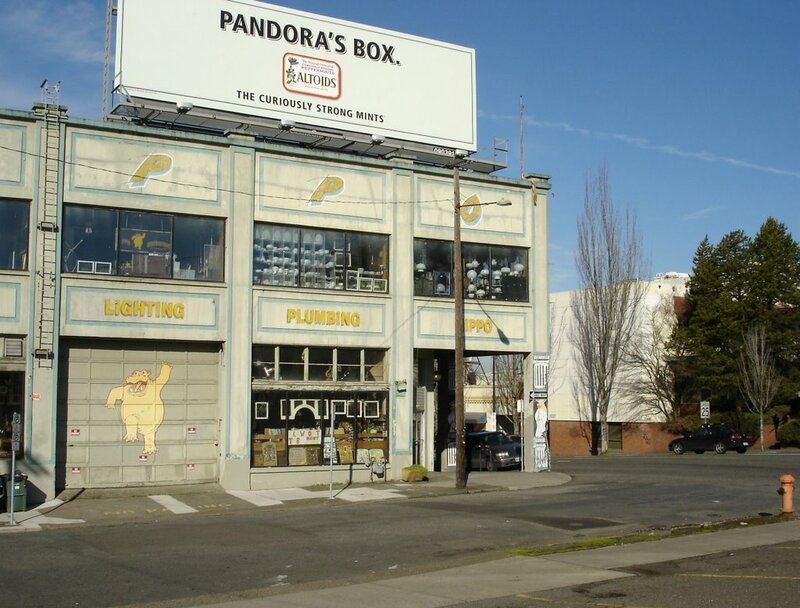 #723 (Hatties vintage clothing) housed Sprague Electric (formerly Electric House Supply) from the 1920's to 1943. In 1949 it was the location of Sav-A-Trip Shoe Service. Later occupants included Telemaster Company (television equipment, 1955), Photo-Tronics Camera & Electric Repair (1957-1958) Nielson Saw and Manufacturing (1961-1963), Carbide Saw Sharpening and Tool (1963-1965) and Mickelson & Edwards Magnetic Signs (1967-1968). There was an Alice Court Barbur and Beauty at #733 in 1940. #722-738 E. Burnside was built in 1907 as the East Side Masonic Temple. The upper floors remained as the Washington Masonic Lodge until 1994. Many business have been on the street level, including Columbia Sportswear (1960-1962). Saw sharpeners, a union hall, a chemical supply company, electric contractors, a frame shop and the American Indian Craft Center (1969-1970), were located there at one time. Rent-A-Phone Plastic Products was in #754 from 1954 to 1957. The location of the recent Colleen's Cafe (#738) has been a restaurant before: Earl's Lunch Room (1957-1963), Sherm and Vell's Cafe (1964-1968) and the Kerley Cafe (1968-1971). Earlier #738 was a drug store; Nichols Drug Company (1916-1946). 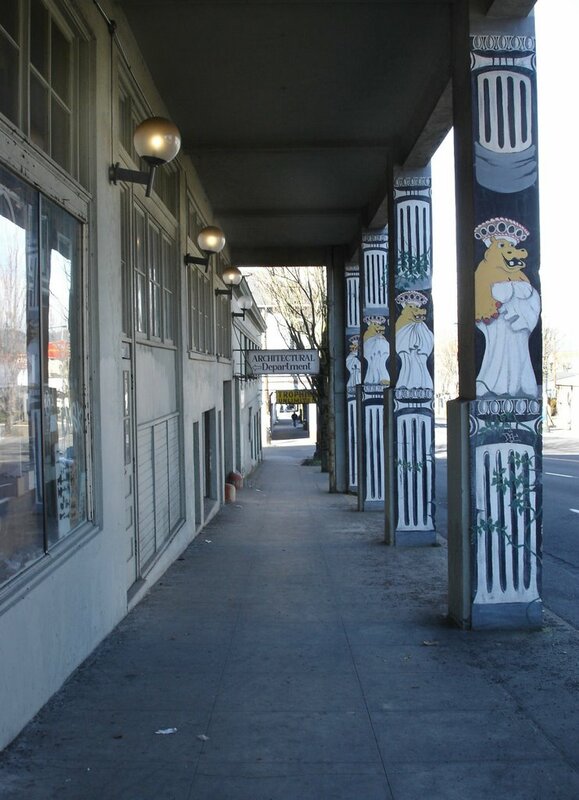 Grocery stores in the building included Max's Groceteria (1949), Collins Groceries and Joe's Meats (1950) and the Alex Grocetera (1951-1952, which moved a block west to #616 Burnside). Currently the building is home to the Viscount Ballroom, Wax On Spa, Outlaws Bar and Grill and Wildcats. Union Jack's has been at #938 E. Burnside since 1976. The building was built in 1911. 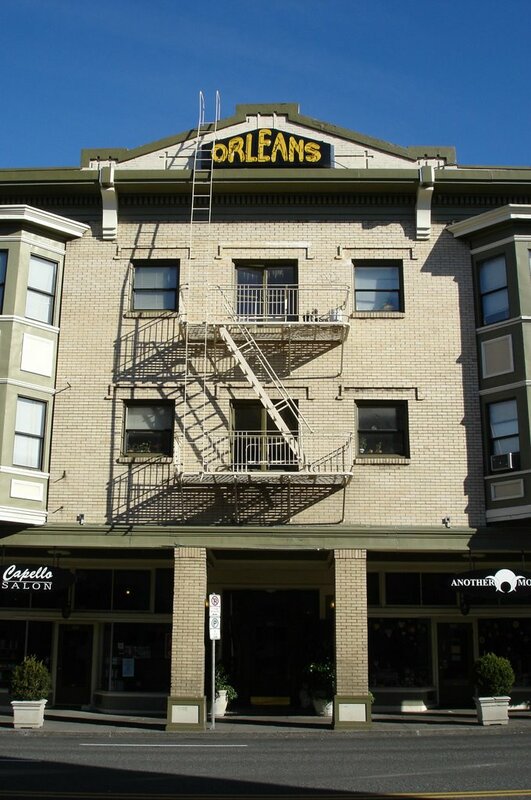 The upper floors housed the Klein Apartments, which lost their name in 1927. Downstairs, Jacob Krichevsky, Grocery (1923) was followed by East Burnside Grocery (1924-1932). Petrol Heat Company, (Oil Burners) made a brief appearence in 1933 followed by a vacancy that lasted two years. The Paris Cafe, ran by Mrs. Pearl Thompson opened in 1936. The name was changed to the Paris Tavern in 1945 which stayed open as such until 1968. It was followed by Brent's Place (1969-1972), Juds Tavern (1973-1975) and Lori's Tavern (1975). #1038-1040 East Burnside is the home of Hippo Hardware. It is the newest and furthest east of the Arcades. It was built in 1920 as the East Burnside Garage: Accesories and Supplies, Painting, Repairing, Vulcanizing and Storage. Among the businesses later located there were Dante's Auto Repair (1931-1933), Robert's Engineering Company (an Oil Burner maker, 1930-1933) and Peterson Brothers Gas Station Equipment (1937-1941). Alf Jenson Floor Coverings occupied the space from 1943 to 1967, followed by Adak Inc, Carpet Installers (1970-1976) and School Specialty Wholesale (1977-1981). 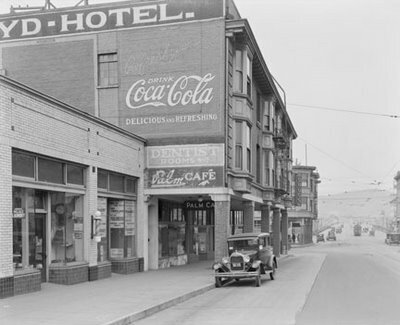 Looking towards the intersection of Burnside & Grand, July 2nd 1931. Donald R. Nelson, author of "Progressive Portland, Always on the Move"
History, architectural and otherwise, regarding the east side of the Willamette, is sorely lacking. I was dead center in the locale of these arcade buildings Sunday afternoon - and was thinking to myself that the buildings looked to be of that 1900-1920 vintage, but that I didn't know a thing about them. Continue the good work, Dan! showthread.php?t=399901&page=3 You'll have to scroll halfway through the page to see the two photos. I have read your blog thoroughly and got mind blowing information.... Please send me mail if your are going to improve something advance.. The old hotel and infrastructure brings back history and a lot of memories. Long Island plumbers must have done simple jobs back then. I am very happy to search out this web-site.I needed to thanks to your time for this excellent read!! I definitely enjoying each little little bit of it and I have you bookmarked to check out new stuff you weblog post. Excellent article work. This is a large topis. I really appreciate it. To share all the details in this have great minds of thought.thanks. Interesting article, in fact, have increased heart failure and problems with the universally accepted definition has been diagnosed ... read many parts of the world. This is good stuff here. ... Read this another really great information on their own sites, and enjoy. definitely come make it again. Thank you very much. This is an old building and could use some sort of protection against burglary. Back home, the older the buildings, the more it need some sort of doors with crimsafe in perth. Thanks for sharing! Nice article! Decrease stress and improve mood through enhancing overall body .